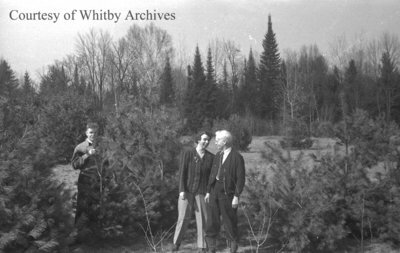 A black and white negative of three unidentified Ruddy family members standing among pine trees. In this view an unidentified man is standing behind a pine tree. An unidentified woman and man are standing looking at each other in the centre of the photograph. Byeways Lodge, April 21, 1941, Marjorie Ruddy. Whitby Archives A2013_040_752B.